The trust continues to deliver safe, quality and responsive patient care in the current challenging economic climate. In addition to meeting day to day pressures, the trust must be prepared to provide a responsive approach to unexpected emergency situations, which although unlikely, may nevertheless occur. These could include infectious disease outbreaks, major transport accidents, mass casualty incidents, planned industrial action, terrorist activity, chemical and biological incidents, and environmental challenges such as flooding. The trust applies a risk assessment process to underpin planning, maintains plans to ensure continued delivery of care (business continuity plans) and shares information with other responders to enhance coordination. This work is referred to as emergency preparedness, resilience and response (EPRR). All of these events described will give rise to health problems and will require the trust to provide appropriate care for affected patients whilst also continuing to deliver high quality care for existing patients. For the best response this will require effective partnership working. 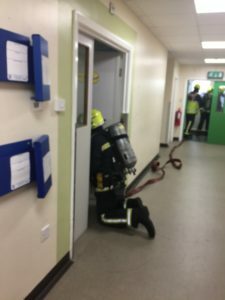 The trust continues to plan, train and exercise with other organisations including Cleveland Police, Cleveland Fire Brigade, North East Ambulance Service, NHS England, Public Health England and other health and social care partners. Julie Gillon, the Interim Chief Executive is the Executive lead for EPRR. Paul Garvin, Chairman of the Trust Board, is the Non-executive director lead. Sally Thompson, Associate Director of Operations is the operational lead. Annually, NHS England issues a set of EPRR Core Standards on which the trust has to complete a self assessment. This year’s assessment rates compliance with the standards as substantial. Substantial compliance shows that there are still areas which need additional work. So the Trust has been actively working to continuously improve. In September we carried out two live evacuation exercises at Hartlepool Hospital and North Tees Hospital with Cleveland Fire Brigade. There is a monthly training session for A&E staff in (CBRN) chemical, biological, radiological and nuclear awareness and decontamination techniques. 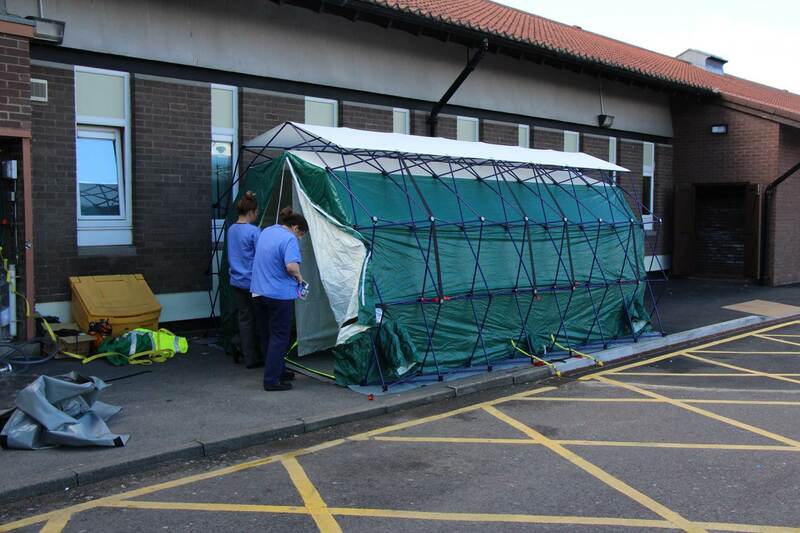 As well as practicals and presentations each session finishes with the erection of the decontamination tent.